It’s that time of year when not only the pace and volume of shipments increase, so does the workforce needed to guarantee success. 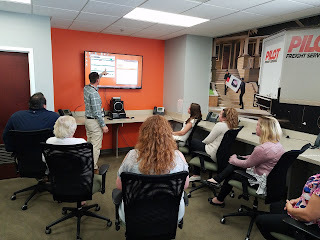 In order to handle the record breaking months Pilot anticipates for November and December, our national customer service team in Lima, PA, will hire 47 seasonal hires to answer calls and track home deliveries for Pilot’s largest national accounts. A handful of these include returning agents, who not only bring experience but also act as resources as newer agents get oriented. Training begins in earnest during the last week of October and continues through Thanksgiving. During this time and leading up to the holiday rush, seasonal agents become familiar with the transportation industry and Pilot’s services. At the same time, they develop a strong foundation of how Pilot differentiates itself as a provider. A visit to the local Pilot operation is an integral part of their training and builds firsthand knowledge of freight handling procedures. “These experiences build confidence and prepare new agents to handle calls in a professional manner, and ultimately provide assurance to each customer about their important delivery,” says Lisa Coyle, Chief Administration Officer. “We strive to build confidence in our agents. If they are secure in their customer service skills, then our customers will feel assured in Pilot.” NCS expects call volume will average 3,000-3,500 inbound calls daily in early to mid-December. Outbound calls average 2,000-2,300 during this time. Last year, Pilot received 4,675 calls in one day!